The Massacre In Depth - THE MASSACRE AT LE PARADIS - HELL IN PARADISE - MAY, 1940. *- Note - British ranks are used in description of German officers in order to enhance the understanding of their roles and ranks. The Escaut Line is abandoned and there is a withdrawal to the Belgium frontline defences known as the Gort Line. 1100 hours: Having withdrawn from the Escaut Line the 2/Norfolks arrive at the Bois de Wannehain on the Gort Line covering a distance of eight miles on foot in nine hours. It is a quiet day for the 2/Norfolks who are now able to rest in their positions. 1400 hours: As part of 4th Brigade, the 2/Norfolks are instructed to hand over their position on the Gort Line to the French and ordered to man a 21 mile stretch of the Canal Line from the railway bridge south east of Aire to La Bassee. 1700 hours: the Brigade is ordered to move into an area around Aubers 20 miles to the west. 2100 hours: The move commences. The 2/Norfolks will face most of the action on and around the Canal Line. Capt. Hastings (2/Norfolks) observes that lack of sleep and the need to be in a state of constant alert is beginning to take its toll, often causing reasonable officers to act out of character. SS Totenkopf under Gen. Eicke reach the Canal Line sending men across La Bassee Canal without reconnaissance. These come under fire from British artillery and mortars. Gen. Eicke brings up his own artillery to help the stricken men. 0700 hours: Having reached Aubers, Maj. Ryder is advised that the 2/Norfolks billets' are at Colon just north of Bethune. Capt. Hastings is sent to reconnoitre the sector. The remainder of the Battalion under Maj. Richardson arrive at Colon, battling through congested roads. A temporary HQ is established. The 2/Norfolks rest and concentrate on concealment from the Luftwaffe. 4th Infantry Brigade advise there are no enemy troops in the area although French civilians tell otherwise. The Royal Scots are near Essar and the Lancashire Fusiliers are north of Le Touret. The 2/Norfolks are down to half strength comprising of 22 officers and 428 other ranks. 1400 hours: Maj. Ryder receives orders to organise reconnaissance of La Bassee Canal from a bridge outside Bethune to the Bois de Pacqueaut as 300 Germans and a few armoured fighting vehicles (AFVs) have crossed and are engaged with some French units. Capt. Hallett is left in charge as Maj. Ryder sets off with the reconnaissance party, which includes Capt. Long, in the direction along the canal from Bethune. This remains incident free until they reach the outskirts of Le Cornet Malo where they come under light machine gun fire from both sides of the Bios de Pacqueaut. This evidences that the enemy are over the canal. Maj. Ryder reports to Brig. Warren at l’Epinette (Brigade HQ) who suspected the Germans were over the canal but only in small numbers. On leaving l’Epinette, German artillery open up between l’Epinette and Locon. Maj. Ryder finally reaches the Battalion area to find his own HQ and other buildings damaged by German artillery. Whilst Maj. Ryder was away, acting Maj. Elwes and Capt. Long have formed the Battalion in a defensive position facing Bethune having received information about the German advance from French troops. Maj. Ryder now intends to move Battalion HQ to Le Paradis and tasks Capt. Hastings to find a suitable site. Driving in the dark and with inadequate maps, Capt. Hastings finds himself near Le Cornet Malo. He retraces his steps to Colon where it was decided that a temporary Battalion HQ should be set up near C Company HQ at Locon. The SS Totenkopf assault engineers complete a bridge over the canal and Gen. Eicke leads the first wave across. Again he is pinned down but a bridgehead is established. He is then thwarted and enraged by Hitler’s ‘Halt Order’ which means withdrawing across the canal with 42 dead, 121 wounded and five missing to be in compliance with the order. Until the ‘Halt Order’ is rescinded the SS Totenkopf can only regroup and prepare for a major assault. British mortar and artillery increase the toll causing Gen. Eicke to order a series of small SS squad raids over the canal line. Early Hours: all four 2/Royal Norfolk Companies move into their position by La Bassee Canal. The 2/Norfolks are now in the centre of 4th Brigade’s position. C Company on the left run into Germans but succeed in driving them back over the canal. A and C Companies confirm they are in position. Battalion HQ await news of B and D Companies. As nothing is heard, patrols from A and C Companies are sent out but fail to make contact. 0300 hours: the men from A and C Companies are stood to. The front is quiet but an increase in Luftwaffe activity is foreseen come daylight. German machine guns open up on C Company but A Company reports little activity. 0600 hours: Battalion HQ hears from D Company confirming they are in position and in touch with B Company. 2nd Lt. Willeson and runners are sent forward to investigate and establish B and D Companies are in the wrong position. Capt. Long notes that B and D Companies have taken up position on a branch line of the canal in error. B Company is supposed to be on the right of the battalion line, then A and D Companies respectively forming the centre with C Company on the left flank. B and D Companies are presently facing Bethune and are too far forward, causing a gap that has to be filled temporarily until they can move back to the correct position. The Battalion’s Pioneer Platoon bridges this gap on the right of C Company until the necessary readjustment can take place under the cover of darkness. Later in the morning: The Pioneers received some support from a unit of machine gunners from depleted Companies of the Manchester Regiment. C Company has been unable to locate any force on their left although the Lancashire Fusiliers are there and attempting to make contact with the 2/Norfolks. Midday: Maj. Ryder sets out for Brigade HQ. Maj. Elwes takes command as Maj. Richardson is missing. Fighting continues along the front. D Company engages the enemy who has crossed the canal. C Company comes under frequent heavy attack as does Battalion HQ. Whilst there is sufficient cable to connect with Brigade HQ at l-Epinette, there is insufficient to connect with the four companies especially as some of their positions at times are uncertain. Battalion HQ therefore has little idea what is happening in the company sectors. Maj. Ryder leaves l-Epinette but instead of going to Battalion HQ goes to A Company to organise a counter attack against a German penetration at Bois de Pacqueaut. To bolster A Company a company from the Lancashire Fusiliers is brought in. The Norfolk Carrier Platoon under 2nd Lt. Elson gives further support. Had there been a cable link to A Company then Maj. Ryder’s prolonged absence from Battalion HQ would have been resolved. 1430 hours: 2nd Lt. Elson meets Maj Ryder on the crossroads outside Le Cornet Malo and an attack is planned to drive the Germans out of the wood (Bois de Pacqueaut) led by Acting Captain Yallop and the men of A Company supported by Lancashire Fusiliers under 2nd Lt Spears. They move into the wood with bayonets fixed. Through machine gun fire, the 2/Norfolks rush the enemy. There are many casualties but they meet the SS Totenkopf at close quarters and drive them out of the wood. Capt. Long reports ‘the enemy is unable to face the bayonet at close quarters’. With Maj. Ryder directing operations, 2nd Lt. Elson’s carriers advance driving the Germans back towards the canal. German resistance stiffens and the 2/Norfolks cannot recapture the bridge. The attack is at a price which leaves Acting Capt. Yallop killed and A Company losing half its strength. Two carriers are destroyed and 2nd Lt. Elson is missing (he later turns up at a POW camp to help Capt. Long compile the report of the Battle of La Bassee). Dusk: Orders are issued for B and D Companies to commence moving into their correct positions. Capt. Hastings is sent out with a small party to reconnoitre a route to the new HQ at Le Paradis. The Germans continue to probe defences and attempt to repair one of the canal bridges. C Company report constant enemy activity and send out a patrol along that section of the canal. Company HQ also organises a patrol to try and make contact with patrols from A Company. 2330 hours: The area is confirmed clear of Germans but A Company cannot be located. There is still an acute sleep shortage. Several attacks are put in on the 2/Norfolks section of the canal line and small bridgeheads are established on the north-east bank. The 2/Norfolks are still holding their own. Maj. Ryder’s plan to move Battalion HQ to Le Paradis is thwarted by lack of maps and signage which causes Capt. Hastings, who is to select a site at Le Paradis, to get lost and end up with a new HQ near Le Cornet Malo. Night of 25th-26th May: it is reaffirmed to move the H.Q. to Le Paradis. Under the cover of darkness the two errant companies move into the correct position and at first light D Company moves into the gap between A Company and C Company and B Company to the right of A Company around Le Cornet Malo. Maj. Ryder has now established a front line. From defending a 128 mile front the total line now being defended by the 2/Norfolks' depleted ranks is approximately two miles, from the Bois de Pacqueaut, just west of the road leading to from the canal, to Le Cornet Malo, along the canal north of Avelette. Now in fox-holes the line is being machine gunned and mortar shelled. Just before midnight: Maj. Ryder sets off to Le Paradis. 0030 hours: The convoy reaches Duriez Farm and the last HQ is established. 0330 hours: The Germans launch an attack on C Company with small armed parties but a much heavier attack went in on A Company and B Company positioned near Le Cornet Malo. The Germans repair a bridge close to area to allow tanks to cross. Supported by intense and accurate mortar fire along the whole front the Germans advance on Le Cornet Malo. Fighting in the village is fierce. At Bois de Parqueaut the enemy is driven out by counter attacks from A Company and B Company supported by the Royal Scots. Mortars supporting this area is running low on ammunition and Brigade HQ is slow to order supplies. Manpower at Le Cornet Malo is now critical and Battalion HQ Duriez Farm receives confirmation that A and B Company are no longer effective. Establishing the front line now involves sending Capt. Hastings up to the crossroads at Le Cornet Malo to locate A Company on the 2/Norfolks' right. Capt.Hastings meets up with 2nd Lt. Slater, who has replaced 2nd Lt. Yallop (killed the previous day) with all that remains of A Company (seven) having been overrun by tanks further up the canal. Lt. Edgeworth, commanding B Company, also arrives at the crossroads advising Capt. Hastings that he has been reduced to 19 men but is holding a line 200-300 yards in front of the crossroads. Although there appears to be no Panzers in the vicinity, Lt. Edgeworth thinks there are Germans in the village in front of his position. Advising Maj. Ryder at Battalion HQ Duriez Farm, Capt. Hastings is ordered to take command at the Le Cornet Malo crossroads with both what is left of A and B Companies. The crossroads is to be held ‘at all costs to the last man and round’. Capt. Hastings gets unexpected reinforcements at the crossroads from 50-60 Royal Scots from north of the canal. Capt. Hastings takes command of them advising them to hold the crossroads at all costs and there must be no withdrawal. With 50-60 Royal Scots and about 25 2/Norfolks together with some extras brought up by Capt. Long they are now in excess of 75 to defend the line behind the hedge row (previously held by Lt. Edgeworth) and astride the road to the wood. The area now becomes under heavy machine gun and mortar fire. Capt. Hastings and Lts. Willeson and Edgeworth (killed later in the day) remain with their companies to arrange the final defended posts. The 1/Scots take over the area between road and wood. Capt. Long drives back to Battalion HQ Duriez Farm noting that many of the wounded are being evacuated from the forward positions. He reports to Maj. Ryder that the position at Le Cornet Malo has been consolidated. Capt. Hastings is also ordered back to Battalion H.Q Duriez Farm leavings Capt. Hallett in command. Maj. Richardson, missing the previous day, arrives at Battalion HQ Duriez Farm shortly after Capt. Long. He had been cut off on patrol with D Company and reports that Germans appear to be present in large numbers. The Royal Scots HQ is moved from Calonne and established in Le Paradis. The 1/Scots are deployed on the right of the 2/Norfolks manning the defences organised by Capt. Hastings and Capt. Long in the Le Cornet Malo and Bois de Pacqueaut area. German Panzers have now pushed through a line between Robecq and St Venant and are bearing down on Merville two miles to the north of Le Paradis. After Brig. Warren departs Battalion HQ Duriez Farm, Maj. Ryder reorganises his officers. Maj. Richardson is appointed 2nd in Command, Lt. Woodwark of C Company is placed in command of A Company, The Motor Transport Officer, Capt. Hallett, is to command what is left of B Company and 2nd Lt. Buchanan is to lead D Company. 2nd Lt. Jones of D Company assumes command of the carriers while 2nd Lt. Merritt takes over Capt. Hallett’s role as Motor Transport Officer. Capt. Hastings is to command HQ Company. Capt. Hastings is to transform Battalion HQ at Duriez Farm into a stronghold capable of being defended from four sides albeit it is not able to withstand a long siege. Spirits are lifted by a message from 4th Brigade H.Q. (Brig. Warren) “counter attack from French imminent” and a tank battalion is on its way. Several messages similar to this are received before Germans release their attack the next day. There is little respite from the SS Totenkopf and defence is fierce but German Panzers are kept at bay by A/T rifles (Anti-Tank Rifles) and LMG (Light Machine Guns). Capt. Hallett takes a proactive approach to his command following Capt. Hastings' departure and leads a patrol from B Company forward to the southern side of Le Cornet Malo firing at Germans approaching from the direction of the canal. Sadly he does not have mortars but his rifles and Bren guns halt the Germans in their tracks. Capt. Hallett, unchallenged, advances again capturing one German (who is in a ditch) with other Germans surrendering without a fight. The prisoner advises Capt. Hallett that he is facing a German Division across the canal. The Germans counter attack driving Capt. Hallett back from his forward posts. He sends out a patrol to identify the German positions on which he launches a mortar attack which has since become available. He is rewarded by what sounds like direct hits. A Platoon of Argyll and Sutherland Highlanders with machine guns arrive and take position behind A and D Companies. The Luftwaffe has a free rein. 1857 hours: OPERATION DYNAMO BEGINS. The SS Totenkopf is preparing to smash their way through stubborn resistance in order to reach Bailleul half way between Le Paradis and Ypres. Within a loop of the Canal d’Aire, two fresh untried German SS Motorised Infantry Units have taken up position between Hinges and Mont Bernanchan. The SS Totenkopt Infantry Regiment 2 commanded by Col. Bertling and Totenkopt Infantry Regiment 3 led by Lt. Col. Goetz supported by 4th Panzer Division and an SS military regiment are to throw their full weight against what they initially thought were the Norfolk Grenadiers. At nearby village of Riez du Vinage the 1st Battalion of Totenkopf 2 have crossed the canal by way of repaired bridge and immediate opposition is encountered. SS Sergeant Leitl, a platoon commander in No 3 Company Totenkopf 2, states the defence of houses held them up for long periods. Riez du Vintage is eventually taken and Totenkopf 2 take cover in Bois de Pacqueaut. At Dawn: an assault is launched at Le Cornet Malo. No 3 Company, commanded by Capt. Fritz Knoechlein, is in the centre, No 2 Company under Capt. Stoeter on the right with Capt. Kaltofen’s No 1 Company in semi reserve. Capt. Knoechlein states progress is slow fighting yard by yard through the villages. Losses are heavy with a platoon commander killed and No 2 Platoon suffering badly. There is a brief respite when they are joined by the arrival of other Totenkopf troops. Dead comrades are collected and Capt. Knoechlein takes a brief burial service. During the service it is alleged he has spoken of avenging their deaths. Increasing numbers of Panzers are crossing the repaired canal bridges. Lorries are also used as bridges for Panzer usage. 0500 hours: tanks appear in B Company’s section. Capt. Hallett notifies Battalion HQ Duriez Farm of about a dozen before his line is cut. Signaller Bob Brown at Battalion HQ Duriez Farm confirms contact with B Company has been lost. Despite falling back, the remnants of Capt. Hallett’s B Company defiantly face the Panzers placing Mills grenades in their tracks under their line of fire. Four tanks are abandoned and, with order restored, Capt. Hallett gets the LMG back into position and the A/T rifles mounted. With the SS Totenkopf infantry some way behind the Panzers (they will suffer from Capt. Hallett’s Bren guns when they arrive). Sadly Capt. Hallett’s B Company also suffer losses and, following the loss of his last rifleman, the injured Capt. Hallett is taken prisoner as he tries to escape. There is a solitary mortar team which includes Sgt. Maj. Ireland and Privates Brough and Cockerel endeavouring to support the defence of Le Cornet Malo. They are finally eliminated. 1000 hours: a heavy counter attack is expected by a French infantry brigade supported by a British tank regiment. This message from Brigade HQ is met with optimism at Battalion HQ Duriez Farm. This is relayed to all companies except B Company where contact had been lost. Had the attack occurred at 1000 hours it would still have been too late for the defenders of Le Cornet Malo as the village was occupied by this time. Two hours before the capture of Le Cornet Malo, ten men from the Pioneer Platoon returned to Battalion HQ Duriez Farm having spent the night in a ruined cottage supporting D Company. A small number of them (volunteers including Ernie Farrow) are assigned to blow the bridge at Pont d’Avelette which had been left intact for the BEF to escape. Using Maj. Ryder’s car they become under intense machine gun fire. Sadly the bridge has already been taken by the enemy. Back at Le Cornet Malo 1st Battalion Totenkopt 2 set up HQ. Capt. Knoechlein tries unsuccessfully to take control of wounded BEF servicemen. The German troops suffer considerable casualties attacking across La Bassee Canal. The defenders, however, are being worn down, A company and D Company report heavy attacks by tank and infantry. Several enemy tanks are put out of action in A Company’s area by A/T rifles and Bren gun fire but their own losses are heavy. Lt. Willeson is wounded in the arm and out of action. Enemy troops and light artillery are on the right front of Battalion HQ and enemy mortar fire coming in from Bois de Pacqueaut. As the SS Totenkopf move forward the 1/Scots are seen to fall back rapidly. Withdrawal is stopped as the 2/Norfolks right flank would be exposed. Battalion HQ Duriez Farm comes under attack from two Panzers 400 yard away. The 2/Norfolks return fire with a hail of machine guns and anti-tank rounds halting their progress for the time being. There is no artillery or air support for the 2/Norfolks. Contact with A Company ceases and C and D Companies are still not reporting back. There is considerable German movement along roads on left flank towards Locon. Maj. Ryder tries to carry out Brig. Warren’s ‘last man, last round’ orders. A platoon of Argyll and Sutherland Highlanders with ammunition, undamaged weapons and suffering only light casualties join up at Battalion HQ Duriez Farm. They are advised of ‘last man, last round’ stance and ordered to return to their former position unless ordered by the 2/Norfolks to do otherwise. However, they are observed leaving their position and abandoning their weapons a few minutes later. Crews from field guns return to Battalion HQ Duriez Farm as probably their position has become untenable – breach blocks are thrown into the pond and they are issued with rifles to defend the farm. The fate of A Company is confirmed. Having been overrun, Lt Woodwark and six men, the only survivors of A Company, reach Battalion HQ Duriez Farm. Getting these men back to defend Duriez Farm is crucial and meets with Maj. Ryder’s approval. Private Albert Pooley is in the remnants of A Company. Mortar bombs begin to rain onto the farmhouse and fires are extinguished. From his position Pooley observes the landscape along Rue du Paradis and enemy soldiers moving behind the farm. Ferocious defence of Battalion HQ Duriez Farm brings the inexperienced SS Totenkopf to a temporary standstill. In open countryside around Le Paradis, the Germans are still suffering severely (one battalion lost, together with all its company commanders, leaving only NCO’s in charge). SS Sergeant Leitl states ‘the defence of houses held them up and they were very exposed as the British snipers were extremely skilful’. As morning progresses: the defence stiffens and the SS Totenkopf attacks break down into a series of small vicious actions. Gen. Eicke begins to struggle to regain control of his troops. By early afternoon: the attack has ground to a halt. Gen Eicke has to get the attack moving again as the taking of Le Paradis is essential for conformity of lines operational on the right and left. If the defence of Le Paradis is prolonged then the SS Totenkopf’s left flank would be vulnerable. Eventually Gen Eicke orders instructions which reinforce that the taking of Le Paradis is essential and all available reserves are to be used to protect the Totenkopf’s left flank. German reports state that the centre of Le Paradis is strongly held by snipers especially around the church and Duriez Farm, the latter being defended like a fortress. With the 1st Battalion almost wiped out orders are issued for 3rd Battalion Totenkopf 2 together with elements of Totenkopf 3 to complete assault on Le Paradis. Regimental Commander of Totenkopf 3, Lt. Col. Goetz, comes with his men to execute orders but is killed by a sniper bullet on reaching the crossroads close to Le Paradis. An attack from the rear is now attempted by a German motor cycle unit. Heavy fire drives them into a farm building just across the road where they set up a defensive position. This unit now delivers a fusillade on Battalion HQ Duriez Farm. The 2/Norfolks find it difficult to close them down until Sgt. Maj. Cockaday grabs a Bren gun and charges into the open firing at the German position. Despite being wounded he keeps the enemy occupied while Maj. Ryder and a small party do a flanking attack, forcing the Germans to fall back. Capt. Long then organises the defences of this now advance post whist Maj. Ryder returns to Battalion HQ Duriez Farm to update Brigade HQ of the position. Regardless of casualties, the SS Totenkopf press forward with mortar rounds and artillery shells. British artillery rounds start to land on Duriez Farm. Capt. Long, dodges through a hail of German bullets, to rectify the position by getting a message out of Battalion HQ to prevent this uncalled for attack continuing. The enemy is now in force to the rear and the battalion is becoming isolated. C Company still reports tanks and enemy troop carriers moving around the left flank. Troop carriers are also moving around the right flank in Le Paradis. These are met with artillery and suffer heavy casualties. iii) Houses left and right of the road and the road block (in front of Battalion HQ). All houses are strongly fortified. News comes through from D Company that only Lt. Buchanan and five men are left. They are driven back to their company HQ where they will stand and fight. This is the last that Battalion HQ Duriez Farm hears from them. German fire intensifies on Battalion HQ Duriez Farm and C Company makes contact. Acting Maj. Elwes inform them that his position is surrounded and requests artillery support. This does not materialise. The lines fall silent and all companies are now cut off from Battalion HQ Duriez Farm. 1300 hours: War Diary of 4th infantry Brigade states 2nd Division issues a Permissive Order to Brig. Warren for withdrawal but no rendezvous given. There is hope for an organised withdrawal in daylight but at 1415 hours a rendezvous at La Nouvelle France is received and communicated to 2/Norfolks who agreed no withdrawal until dark. It is requested this be passed on to 1/Scots but this cannot be achieved until after dark. 1330 hours: Several more shells slam into the Battalion HQ Duriez Farm. HQ and Brigade War Diaries record the last courageous message from Maj. Ryder is received at this time. ‘HQ on fire, wireless in cellar could not be got out therefore it would be broken up”. The Regiment is fighting on its own ground and is surrounded. Maj. Ryder’s final words are that “he would bring his Battalion to the rendezvous after dark”. No further communications are received. The wireless is destroyed and Battalion paperwork including Capt. Hasting’s diary notes are placed in a sack and thrown into the pond. All other equipment, which could prove useful to the Germans, is destroyed including rifles and a remaining truck. 1600 hours: Capt. Long reports that the Battalion’s strength (including 50 in C Company) is estimated at 100 all ranks. C Company, although numerically strong, is without communications, completely isolated and outside the main movement of events. Capt. Long surmises the enemy can therefore hold C Company and deal with them later whilst concentrating on reducing key centres of resistance. German units are still moving to rear of Battalion HQ Duriez Farm which provides good targets but too many for the available ammunition. Capt. Hastings collects rounds from the wounded and issues orders to fire only when certain. 1640 hours: This is the time 2/Norfolk’s records state that the permissive order from Brigade is received stating ‘hold position until dusk then if possible withdraw to North East to La Nouvelle France’. The message could not be relayed to 1/Scots and Lancs Fuseliers. Maj. Ryder calls a conference with his available officers suggesting when darkness falls parties of men, each accompanied by an officer, should attempt to crawl out of Battalion HQ Duriez Farm. This is a forlorn hope as darkness is several hours away and it would not take the Germans long to overwhelm the farm. Maj. Ryder concedes that it is unlikely that they could get away and he would later give the remaining men a stark choice. With the farmhouse burning and the roof in danger of collapse Maj. Ryder orders everyone out. Signaller O’Callaghan makes for the byre with bullets whining around him to join up with about 40 other men. Two shell bursts have wounded Capt. Long and Lt Woodwark. They both manage to stumble outside the farmhouse. On returning to his post, Capt. Long is patched up by Maj. Ryder and then slips into unconsciousness for about 25 minutes. Maj. Richardson and 2nd Lt. Willeson are unaccounted for and assumed killed when the roof collapsed (they are both remembered on the Allied Memorial to the Missing at Dunkirk). Maj. Ryder seeks the opinion of his men – surrender or fight to the finish. He had earlier received mixed feedback around the farm but in the byre for the last time he asks them whether to fight or surrender. He is not ordering them one way or another, he is giving no more orders and would accept their decision. Reaction is mixed but the majority accept surrender. A dirty towel is found which is tied to a rifle and displayed until the Germans stop firing. The first group of men walk out but only go a few paces before they are cut down by machine gun fire. Tense moments pass before they try again, this time no shots are fired. 1715 hours: the surrender is complete. The captured soldiers are marched to Louis Creton’s farm where they are massacred along with others by the S.S. Totenkopf Division’s 2nd Infantry Regiment (1 Bn TIR 2). The alleged motive is that the men in 3 Coy, 1 Bn TIR 2, who had spearheaded the attack on Le Cornet Malo, were ordered to bury their dead in that village. After the burial it is alleged Captain and assault leader, Fritz Knoechlein, called for revenge. At same time as Maj. Ryder surrendered, Capt. Long regains consciousness in a ditch south of the farmhouse. He is with Lt. Draffin (Medical Officer), Capt. Hastings and a few other men. A white towel is produced by Capt. Hastings and the firing ceases. They are joined by 25 other captives and marched east to the crossroads at Le Paradis. Capt. Long is allowed to look for wounded. Two miles south, 50 members of C Company are ready to fight on with communications lost between them and Company HQ at Locon and Battalion HQ at Le Paradis. Acting Maj. Elwes has therefore no knowledge of what is happening and can only follow the last order he received from Brig. Warren ‘last man, last round’. At night Maj. Elwes withdraws to Company HQ at Locon. Capt Long’s assessment had been right C Company could be mopped up by the Germans at leisure once Le Paradis had fallen. 28th May: German troop carriers close in on C Company’s HQ at Locon. Maj. Elwes carries out the last known orders and attacks them. He is killed but, to save unnecessary casualties, 2nd Lt Simpson surrenders. C Company’s is numbered at 40. Capt. Long is marched to Locon and counts about 70 officers and men upon arrival. Among them are Capt. Hastings, Lt. Draffin and Capt. Gordon, the latter being brought in with the remnants of the 1/Scots. The following details with regard to the lead up to the massacre at Le Paradis are taken from original documents written either at the time or just after the massacre, all of which are available on this site. ​The fourth infantry brigade second division consisted of the Second Royal Norfolks, the First Royal Scots and the First and Eighth Lancashire Fusiliers. On the evening of May 23rd the brigade moved to the Bethune area in Northern France. After a few hours rest the battalion was ordered to take up positions on the Bethune-Estaires Canal in the neighbourhood of Le Paradis. A, B and D Companies were forward with C in reserve, but at first light it was discovered that B Company, which should have been in the centre, was in position on the wrong angle of the canal, on the Bethune loop and at right angles to the battalion line. With it was D Company. This left a wide gap between A and C companies which was filled temporarily by Pioneer Platoon until the other two companies could move into their correct positions after dark. All through the day of 25th May, the situation remained confusing. The enemy was reported to be in strength in the Bois de Pacqueaut on the right of the battalion positions, but a counter attack by A Company drove them out and they regained contact with the Royal Scots who were holding the sector on the battalion's right. Although the four companies were very much reduced in strength, the length of the front held by the battalion was 5,000 yards and the gaps in between were covered by machine guns. All through the day the enemy made attempts to get across the canal using sunken barges as bridges, but they were held up at all points by the heavy small arms and machine gun fire of the front line companies. During the night of 25th/26th May, B and D companies moved to their correct positions and were dug in at first light with B company on the right of A Company at Le Cornet Malo and D in the gap between A and C Companies. The first attack came at 3.30 am against B Company on the right with a lighter attack on C Company on the left flank. At the same time heavy and accurate mortar fire on the remainder of the front not only pinned the other two companies down but also caused heavy casualties. 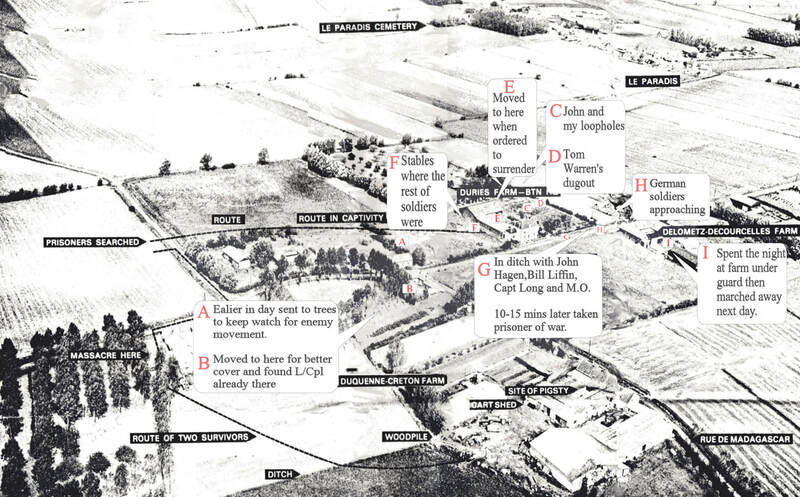 The attack on the right gained a good deal of ground and, although B Company and a company of the Royal Scots made several counter-attacks, they were unable to completely restore the situation. The enemy pressure continued during the morning and casualties mounted and by noon A and B Companies reported to battalion headquarters that they had hardly any men left. Captain Hastings and Captain Long were sent from battalion headquarters to re-organise the two companies into one unit. This was done and the company now numbered about 60 men and the defence of Le Cornet Malo continued. By early afternoon the situation on the canal was desperate but, in spite of the severity of the fighting and the heavy casualties, the morale was high and there was no sign of wavering. By the late afternoon the enemy came across the canal in strength and both B and C Companies were engaged in hand to hand fighting. To add to the difficulties, the Germans managed to get some tanks across the bridge at Le Cornet Malo but many were knocked out by the anti-tank rifles. By the end of the day all enemy attacks had been held and driven back though at a terrible cost. Nevertheless the battalion line still held. The holding up of the enemy on this canal front was facilitating, indeed permitting, the safe withdrawal to the coast of many units. It was a defence in itself to deny to the enemy the complete fruits of victory and to make possible the escape of so many British soldiers across the beaches of Dunkirk. The night of the 26th/27th was quiet and it was possible to bring up hot meals for the troops. Dawn on 27th May saw the second battalion once more heavily engaged. A strongly re-inforced enemy mounted a full scale attack, preceded by a barrage at 3.30 am, crossing the canal by bridges repaired during the night. The main weight of the attack was on B Company at Le Cornet Malo which was quickly overrun. By 10 am B Company was out of touch with battalion headquarters and was presumed wiped out. The three remaining companies were heavily attacked and, with the lack of air support and artillery, it was impossible to hold the enemy. D Company reported they were down to one officer and five men. C Company had been bypassed and had about 50 men left. A Company had one officer and six men and these made their way to battalion headquarters. The total strength of the battalion was now about 100 men. During the afternoon the enemy worked its way round to the rear of battalion headquarters but was driven off by the action of the regimental sergeant major and a small party while Company Sergeant Major Whitlam and two men worked round their flank. The German casualties at this stage of the fighting were tremendous and for a short time the fire slackened. The commanding officer spoke to the brigadier by radio and assured him that, although the situation was hopeless, all efforts would be made to hold on as long as possible. By 4.40 pm the last phase had begun. Battalion headquarters was surrounded and carried on with an all round defence loopholing (knocking bricks out to fire through) all the outbuildings. The farm buildings were hit repeatedly by shells and mortar bombs and were soon on fire. The wounded were brought up from the cellars and, with the ammunition almost gone, the commanding officer ordered the surrender. The end came at 5.15pm. A total of 97 soldiers were rounded up and, after being subjected to acts of brutality which included being spat at, kicked and beaten with rifle butts, were marched to a nearby field where a hole in the ground had already been dug, apparently in readiness. There they were mown down by two heavy machine guns. The adjutant, the Medical Officer and three men went out of a different door onto the road and were taken prisoner by a different company of Germans and were treated in accordance with the rules of warfare as laid down by the Geneva Convention. A number of British soldiers were shot as they went forward under the supposed safety of white flags. Bill O'Callaghan who survived the massacre, later gave an account of the massacre for the trial of Fritz Knoechlein. These words are taken from his affidavit (you can read the full affidavit by clicking here). "We hung a towel on the end of a rifle, and shortly afterwards all firing ceased. We opened the door and started to file out with our hands above our heads. The first dozen men out were mown down, then the firing ceased. We marched down to a field about 300 yards away, here we were searched. After we were searched the wounded were attended to and we were lined-up in threes and marched across a field. After we had been searched some high ranking German officer (I think he had red lapels on his greatcoat) came up and spoke to the other German officers there (I cannot remember how many there were) and waved his hand, whereupon we moved off. "We halted on the road, about 200 yards from where we had been searched, to let some vehicles pass. We started off again to march along the road and met German troops who behaved in a very brutal manner towards us, hitting us with their rifles and pushing us about. On the march we halted once or twice, and it is possible that one of those halts occurred just before we turned off into a gateway leading into a farm. On passing through this gateway I noticed a pasture on our right and a farm building on our left. "As I was turning into the gateway, I noticed a machine gun in front of us which appeared to be mounted in front of what I thought looked like a farm lavatory. After having passed through the gateway the gun was then on my right. The whole column continued to march forward along the side of the house, with their hands still behind their heads, when suddenly firing started. The men started falling from the front of the column. When I saw the men falling I threw myself forward and fell into a slight depression in the ground, and in falling stretched my arms out before me, and sustained a slight flesh wound in the left arm. "After the firing stopped I heard my comrades shouting and shrieking in their agony. I then heard what sounded to me like the fixing of bayonets and, shortly afterwards, I heard moans and shrieks from more of my comrades, which sounded to me as if they were being bayoneted. I did not see this, since I did not lift my head, as I was afraid of being bayoneted myself. There was also pistol and rifle shots, which lasted for several minutes. The Germans left before long, after having made sure that there was no sign of life. After a while two Germans came and stood behind me and I heard them talking, but they left again without having done anything." "The first attempt to surrender was made by three men who walked into the open displaying a white cloth. They immediately came under heavy machine gun fire. The second attempt was then made by all of us running out into the open with our hands in the air. No further fire came from the enemy who stood up and cheered and a German officer ordered us to come forward with our hands in the air. "We were lined-up and searched, our helmets were struck from our heads and our equipment and gas masks were forcibly removed. We had no weapons with us as these had been destroyed before we surrendered. Not one of us to my knowledge still possessed a weapon when we were searched by the Germans. We were told by an English speaking German NCO that any wounded could sit down, whereupon some of us did. I was one of those (I had been hit in the left arm and right hip, but not seriously wounded), but no sooner had I sat down then I received a brutal kick in the ribs from a German soldier and was ordered to stand up. "During the march which then took place, several of us were struck because we did not answer questions or were not quick enough in obeying the orders of the Germans which naturally were unintelligible to us. During this time our wounded were being brought out of the farmhouse by our own stretcher bearers, but I do not know where they were taken. "After some 15 minutes we were ordered to form up on the road with our hands clasped behind the backs of our heads. During this process some of us were struck with rifle butts while standing in the ranks. The guards who did this were not reprimanded by their officers or NCOs. While we were standing there our numbers must have been swollen by the addition of other prisoners because when I turned round I could see that the column had lengthened. I do not know where these additional men came from. "At this time I estimate the number of prisoners in the column to have been 65 at the very least. We were then ordered to march along the road, all the time being struck and cuffed by the guards and any other Germans passing us. Our direction at this time appeared to be westerly across the road leading to Le Paradis until we came to the vicinity of another farm house with a field adjoining it on the western side. "We halted on the road for two or three minutes. During this time a German took from my pocket a packet of cigarettes and when I turned to look at him he struck me with his rifle, knocking me through the ranks. An unbroken line of German transport was standing on the right hand side of the road facing us. ​"We were then ordered to march again and it was at this moment that I saw what had apparently been prepared for us. At the far end of the field opposite the farm house I saw two machine guns, one of which was already in position and the other was in process of being set up. Some distance behind the guns there was a hedge. "Standing just inside the gate leading into the field was a group of about a dozen Germans who seemed to be having a discussion. One of this group whom I saw at close quarters a few minutes later I identified as an officer by the silver cord on his peaked cap. He was about 5ft 10in tall, was of slim build, had a dark face with a prominent hooked nose and dark piercing eyes and was 35-40 years old. I am inclined to think that this group comprised officers and NCOs, but I cannot give the exact number of each. I cannot describe any of the other officers or NCOs and I do not think that I would be able to recognise any of them were I to see them again. "At this moment the troops guarding us ordered us to continue the march. At this point we left the road and went into the field through the gate and I noticed at the foot of the wall of the farmhouse (which was then on our left) a large hole which was at least five feet deep, 15 to 20 feet long and about eight feet broad. When the first prisoners reached the far end of the hole firing commenced. "I was then just entering the gate. It seemed that as the men were hit they fell into the hole. When I reached the hole the man nearest to me, Private Ward, was hit and I felt a sharp pain in my left knee and fell into the hole. I fell on top of some men who were already lying there and others fell on top of me. Firing continued for a few seconds during which time I noticed Major Ryder sitting inside the hole with his back to the side nearest to the wall. He seemed to me to be very badly hit. "Groans were coming from men lying in the hole and it was at this point that three Germans jumped down into the hole near Major Ryder evidently for the purpose of finishing off any prisoners still alive with bayonets. These Germans evidently climbed out of the hole again because further shooting then started with revolvers and rifles from the edge of the hole. One of the men beneath me moved and two shots were fired into the heap of bodies, both of which hit me in the left leg. At the sound of a whistle firing ceased and all the Germans appeared to move away because I heard no further sound in my immediate vicinity. The shooting took place at approximately 15.30 hours." "As late afternoon was approaching things were getting desperate, men were getting killed and wounded and the ammunition was almost finished. The CO Major Ryder got onto brigade by radio and told them the position, but he was told to hold on as long as possible and after dark make his way north. After another two hours there was no hope of lasting until dark as at the end of May we didn't get dark until late. The CO now made the decision to cease fighting and said that if any man thought he had a chance of getting away he could do so. ​"Bill, John and myself thought that if we kept in the smoke from the burning house we might make it. We went out of the side door into a ditch beside the road. The remainder went out of the cowshed door onto the field. At first they were met by a hail of bullets. Then at the second attempt the Germans came rushing out shouting. They were knocked about by rifle butts and kicks, then taken across to some more buildings and searched. "After a while they were marched across a road to a farm and, as they marched alongside a building, two machine guns opened fire and mowed them down. The Germans then went along and shot anybody that moved. By a stroke of luck Bert Pooley and Bill O'Callaghan, although wounded, survived underneath and eventually crawled away. " After the shooting, Bill O'Callaghan, feeling completely exhausted, fell asleep for something like five to six hours and was woken up by Bert Pooley shaking his leg. He later put this down to sheer exhaustion brought about by lack of sleep. Together O'Callaghan and Pooley made their way across a field with O'Callaghan carrying and dragging Pooley despite the difference in their size (Pooley was well over six foot tall and O'Callaghan barely 5ft 6in). They found a barn and opened the door. Inside their saw a number of SS officers eating, drinking and celebrating. They made their way across to a farmhouse and found a pig sty which they made as comfortable as possible after chasing out pigs and chickens. They cleaned the place up and Pooley was laid on a bed of straw. They lived in the barn for three days and nights, feeding on raw potatoes and drinking rancid water from puddles which made them ill.
On the fourth day they were discovered by Frenchwoman Madame Creton and were given their first food for days - egg, milk, bread and butter. Pooley had his wounds dressed. The French family were taking considerable risks in doing this as the Germans had threatened to execute any civilians supporting or helping Allied soldiers. Madame Creton and her son Victor continued to look after the two soldiers until it was agreed with them that they should be handed over to the German Wehrmacht. Bill O'Callaghan recovered from his wounds and spent the rest of the war in Prisoner of War camps in Poland and Bavaria. Bert Pooley stayed in German hospitals until 1943 before being sent back to England in the first batch of repatriated prisoners thought to be of no threat to Germany. Whilst in captivity neither Pooley nore O'Callaghan mentioned the massacre for fear of reprisals. On returning to the UK, Bert Pooley related his story to the military authorities who refused to believe him. Pooley also refused to give O'Callaghan's name for corroborative evidence due to his concern about word getting back to Germany where Bill was still a prisoner. Pooley told a magazine after the war that he began to believe that the massacre had been a delusion: "I couldn't eat or sleep and was in a perpetual state of nervous tension. In the end I began to think I might be suffering from delusions. I didn't even tell my own family the whole truth in case they didn't believe me." At the end of the war, Bert Pooley decided to return to France to prove to himself that the massacre had indeed taken place. In September 1946, Pooley returned and saw the farmhouse and the site of the mass graves. By this time the bodies had been exhumed and re-buried in the village churchyard. He saw the bullet holes but more importantly met Madame Creton, the French woman who had helped him and Bill O'Callaghan. Bert this time reported what had happened to the French authorities. The facts were relayed to the War Office in London and Bill O'Callaghan went to the capital to corroborate the details and, in a prisoner-of-war camp, the two soldiers identified Fritz Knoechlein as the man who had given the order to fire. The trial of Fritz Knoechlein took place in Hamburg on October 11th, 1948. This is covered in depth in other parts of this web site. To assist the reader there follows transcripts from the O’Callaghan and Pooley affidavits taken from the United Nations War Crimes Commission and their cross examinations undertaken by Mr Field-Fisher in front of the Judge Advocate at the Trial of Fritz Knoechlein on Friday 15th October, 1948. The affidavits and cross examination transcripts deal purely with the massacre at Creton’s Farm. The trial of Fritz Knoechlein held in the Curiohaus at Hamburg, opened on October 11th, 1948, before a court of six. Its president was Lt. Col. E. C Van Der Kiste of the Essex regiment. The others were Mr H. Honig (the judge advocate), Major P. Witty, Major C. Champion, Captain J. E. Tracey and Captain A. Preston. Mr T. Field-Fisher was the prosecuting counsel and the counsel for the defence was a Doctor Uhde. O’Callaghan’s Affidavit: This part of the affidavit begins following the surrender and march to Louis Creton’s farm. On the march we halted once or twice, and it is possible that one of those halts occurred just before we turned off into a gateway leading into a farm. On passing through this gateway I noticed a pasture on our right, and a farm building on our left. As I was turning into the gateway I noticed a machine gun in front of us which appeared to be mounted in front of what I thought looked like a farm lavatory. After having passed through the gateway the gun was then on my right. The whole column continued to march forward along the side of the house, with their hands still behind their heads, when suddenly the firing started. The men started falling from the front of the column. When I saw the men falling I threw myself forward and fell into a slight depression in the ground, and in falling stretched my arms out before me, and sustained a slight flesh wound in the left arm. After the firing stopped I heard my comrades shouting and shrieking in agony. Then I heard what sounded to me like the fixing of bayonets, and shortly afterwards I heard screams and shrieks from more of my comrades, which sounded to me as if they were being bayoneted. I did not see this, since I did not lift my head, as I was afraid of being bayoneted myself. There were also pistol and rifle shots, which lasted several minutes. The Germans left before long, after having made sure that there was no sign of life. After a while two Germans came and stood behind me and I heard them talking, but they left again without having done anything. I must have gone to sleep then because we had had very little sleep during the past 18 days. The next thing I knew was someone was pulling me and I woke up to find out that it was a comrade by the name of Bert POOLEY who was lying underneath a pile of bodies beside me. I asked him if he was hurt and he asked me to get him out. I went to the nearby barn, opened the door and saw Germans inside. I went back to POOLEY and carried him away for about 300 yards where I placed him underneath a bush. I went and fetched a blanket and then we made our way as best we could until we came to a burning farm-house where there was a concrete pigsty. I made this as habitable as possible and we both stayed there. Three days later a French civilian woman found us there. She supplied us food, bandages and dressings etc. for POOLEY’s wound although she was endangering her own life by helping us. Eventually other French civilians also came to see us there, some of whom also brought food. One day whilst I was away from the pigsty, trying to get some food, I saw a car turn into the farm-yard and two Germans and a Frenchman got out and went to the pigsty. They left again about 15 minutes later and I returned to the pigsty. POOLEY told me that they had said that the Frenchman was to take us into his house in the village and we were going to be fetched from there by an ambulance and taken to hospital. The Frenchman, however, never came back to fetch us, But some days later, I think at the request of a Polish refugee to whom I had spoken, a French ambulance came to take us away to a hospital in BETHUNE. I remained in hospital for 16 days and was then fit to join a column of British prisoners marching into HOLLAND. Q. Now you mentioned a gateway. Was that on the same side of the road as the farm or the other side? A. That was on the same side as the farm. Q. You mentioned turning – did you halt again anywhere near this farm or before you turned anywhere, or did you just march straight to wherever you went? A. I think we halted just before we got to the gate. Q. Did you move off again shortly afterwards? Q. Who told you to move off? Could you see anyone from whom an order came? A. No, I never saw or heard anyone. Q. You marched off because the head of the column started? Q. When you started moving, where did you go? A. We started to move through the gateway. Q. On the right side of the road? A. On the right side of the road. Q. As you went through the gate, where was the farmhouse, on the right or left? You made the turn to go through the gate, was it on your right or left? Q. Did you notice anything as you entered the gate? A. What I took to be three or four German officers standing just inside the gate on the right hand side. Q. There was a small group, was there? Q. You recognised them as officers or did you not know what they were at the time? A. I did not know what they were at the time. Q. Did you presume they were officers or N.C.Os or what? A. I presumed they were above ordinary soldiers by the hats that they were wearing. Q. Were they just standing there, or were they doing anything in particular? A. I only just got a passing look at them. They did not seem to be doing anything at that precise moment. Q. Were they the only supposed German officers that you saw at this time, just this little group? Q. Did they or any of them appear to be in charge of what was going on, or could you not tell? A. I could not tell. Q. When you got into the field, did you notice anything else in the field? A. Yes, I noticed a machine gun. Q. One or more than one? A. I only saw one. Q. And as you marched into the gate, was that on your right or left? A. It was on my right. Q. And in what direction was it pointing? Q. You were marching across the line of fire of it? Q. Now you have said that when you entered the gate, the farm building was on your left and the machine gun was on your right? Q. Was the farm building quite close up to the gate or some way away from it? As you went in the gate, was it quite near on you left hand side or was it some way away? A. Not too far away. I was not actually near the wall of the house, I was on the right hand side. Q. What do you mean by “not too far”? A matter of a few yards or a hundred yards or what? A. A few yards, it was not a hundred yards. Q. How far, running from the road back into the field, do you suppose the wall of the farmhouse ran? Was it just a sort of little gable end or quite a long wall? A. Quite a decent length. Q. What sort of building was it? A. As far as I can remember that was a red brick building. Q. Did it look like a house or a barn or a stable or what? A. It looked like a house, I think. Q. Might he be shown Exhibit No.2? (Photographs, Exhibit No 2, are handed to the witness). You will find two pages of photographs there which have been exhibited. On the first page you will see a large house – at the top of the page. Is that anything that you recognise? A. It looks like battalion headquarters. Q. Now the second photograph shows a path or road, with a sort of white building and a rather large brick building on the right hand side of the road in a little open field. Do you recognise that as anything? A. I recognised that (indicating) but I do not think the white one was there when this action took place. Q. Was there another building there, as far as you remember, in place of the white one, or was there nothing there? Q. Very well. You may recognise this brick building? Is that the one you have been talking about? Q. And the photograph at the bottom of the page, you will see, is a closer view of the same barn or house, or whatever it is. Q. And likewise over the page you will see that the top and bottom photographs are also of a brick place. Is that the place that you have been referring to? MR. INTERPRETER: Yes the witness is pointing to the top photograph o Page 2. MR. FIELD-FISHER: Was that the building that lay on your left hand side when you marched through the gate? A. Yes, but with one exception. The doors on this photograph, I think, are new ones, because if I remember rightly at the time this shooting took place there were two big doors here, opening into a kind of barn. Q. And did you notice anything about the roof on the photographs? Does that look like the same roof that you noticed at the time? A. I do not think I took so much notice as to see what the roof was like. Q. I see. Did you notice anything else about the field, or the farmhouse or whatever it was, or its immediate vicinity that would help you to point it on the map? A. I think just before we got to the field we passed a small shrine. Q. Did you notice where that was, which side of the road, or what sort of thing it was? A. I think it was the Virgin Mary and a small…..
Q. A little road side shrine? Q. Was that near the road? A. Yes I think that it was near the road, but at which side of the road I cannot remember now. Q. Now we have reached the stage where you are entering the gate, and you noticed there was a machine gun in the field on your right and it was pointing to the column of marching prisoners. How far away on your right was it? A. I think that it was farther away than I thought. In a case like this you see a thing and it appears to be right close, when really it is not too close. Q. Can you give any approximation? A. About 150 yards, I should think, Sir. Q. Where were your hands at this time, all the prisoners? A. Still behind our heads. A. The next thing that happened after we got in front of this wall, the machine guns started to fire. Q You say you got in front of this wall. Was the wall longer than the marching column, or shorter, or the same length? A. I never had the time to find out. Q. But were you more or less all in front of it, as far as you could tell? Q. About how far do you think you had gone inside the gate when the shooting started – you yourself? A. I think I myself had gone about 30 or 40 yards. Q. Did you hear anyone give an order to fire? Q. You did not hear anything shouted, or anything like that? Q. When the machine gun opened fire, what happened to the prisoners in front of you? A. They were cut to pieces. Q. Did you see them fall? Q. Did they all start falling together, or did they start falling gradually from the front of the column? A. From the front of the column. Before they got anywhere near me I was falling down myself. Q. Did you fall in any particular way, or on to anything or into anything? A. I fell head first into a heap of thistles. Q. Was the ground level at that place? A. No, I fell in a slight hole in the ground, I was half in and half out. Q. Where you hit at all? A. Yes, I got hit in the arm. Q. Did the firing stop? A. After a time it stopped. Q. You have no idea how long it went on for, I suppose? It is very difficult to judge in those cases. A. No, I could not judge how long. Q. It might have been seconds, it might have been minutes? Q. After it had stopped, what did you hear? A. Well, I dare not move myself, but I heard what I thought was the fixing of bayonets. Q. After the firing did you hear any sound from any of your comrades? A. Yes, there was a lot of shrieking and groaning. Q. Were you on top of any of them, or underneath others? A. I was on top. Q. You heard what sounded like the fixing of bayonets? Q. Did you hear anything immediately after that? A. I heard the fellows who were shot crying out. Q. What sort of shots were they? More from the machine gun, or anything else? A. They might have been from rifles or revolvers. Q. Not from machine gun? A. No, not from the machine gun. Q. Where they close to you? Q. You could not see what was going on? A. I could not see. Q. Were there many of these pistol and rifle shots, or just one or two isolated ones? A. I should say there were quite a few; I could not judge how many, of course. Q. Did you hear the Germans around for some time, or did they go away at once? A. After about five or ten minutes, I judge, they went. It might have been less and it might have been more. Q. Before we leave the actual shooting, I wonder if it is possible to tell the court, if you could see, what part of your comrades’ bodies was most generally hit by this machine gun fire? Could you see where it was aimed at? A. The face and the head. A. After about half an hour had gone I started to pull my arm from underneath the fellow who was lying on it. Then I heard somebody coming and I take it that they were two Germans, and they stood directly behind me, conversing in German, which I did not understand. Q. You did not see them, of course? Q. Did they then go away? A. I should say they stood there about ten minutes, because I was wondering when they were going. Q. I want you if possible to try and fix the approximate time when this execution took place. You said, I think, that the surrender took place in the neighborhood of 2 o’clock or half past. Could you put a very approximate time on it? A. In the early evening, I should say round about 4.30 to 5 o’clock. Q. It was still light? A. It was still light, yes. Q. After these Germans who came and stood behind you had gone, what did you do? A. I must have fallen asleep. Q. Were you in a very exhausted condition? A. Yes, I had not had any sleep, hardly, for about seventeen nights. Q. What was the next thing you knew? A. The next thing I knew was that somebody was shaking me. Q. Was it daylight then, or dark by that time? A. It was dark and raining. Q. And who was it who was shaking you? Q. And who was it? A. That was Private Pooley. A. I asked him if he was hit badly, and he said yes, he was hit badly in the leg. He asked me to get him out of it and I pulled him out among the heap of bodies and put him on the grass round about where I had been lying. Q. At this time was there any sign of any German troops around? A. Not that I could see. Q. Did you hear anything? A. I went to this barn because it was raining, and I thought we would get in there and have a sleep, but when I opened these big doors there were some German cookers in this place, so I shut the door and came back. Q. Were the cookers in operation, could you see? Were the Germans inside? A. I think they were. Q. How near to that to the heap of bodies lying outside the barn? Very near, or quite away? A. Where the cookers were? Q. Yes, the barn in which they were. Q. Where did you and Pooley take yourselves to? A. I carried him away, about 300 yards, I should say, and then he said there were some blankets back where we were, by the machine gun, and he asked me to go back and get them. Q. You carried him away somewhere about 300 yards. Where did you reach after you had gone that distance? A. Just a field, that is all. Q. You were still in the field, yes. Then you mentioned blankets, and what did you do? A. I said I would go back and see if I could get one. Q. Did you do so? A. I went back twice; the first time I did not get one, the second time I got one. Q. After you had got the blanket and you went back to Pooley, where did you two go to then, or did you stay where you were? A. We stayed where we were for a few moments, and I went and searched around and found some water in the ditch, and we had to go over this ditch. I got him over the ditch and then he pulled himself as far as the barbed wire fence – or a few strands of barbed wire. Just behind this wire there was a farmhouse, and it was burning. Q. It had been burnt, or was it burning? A. Still burning. We got through the wire and then we found, or I found, a Dutch barn, what I call a Dutch barn, with just a roof and no sides. Q. Did you go in there? A. Inside there was a wagon, and some straw and some sacks, and we got underneath there. Q. Have you any idea about how far that Dutch barn was from where the shooting took place? A. About half a mile, I should say. Q. Assuming, of course, that you had walked or crawled in a straight line. Q. Is it possible for you to tell now – of course, it was night at the time – in which direction was that? In relation to the barn where the shooting took place, have you any idea which way you went? A. I had not then but the next morning when I woke up I saw we were near the village of Paradis. Q. Had you in the course of your crawl during the night crossed the road, or had you just been across fields? Q How long did you stay there? Q. Yes, before anything else happened to you. A. Until about 4.o’clock in the morning. Q. Did you go somewhere after that? A. After that I looked round for a safer hiding place, and went in a wood pile in the corner of the farmyard. Q. This Dutch barn was all part of the main farm, was it? Q. Did you know then, or do you know now, what the farm was called where you sheltered. A. I did not then, but I do now. Q. And what farmhouse is that? A. It belonged to Madame Creton. Q. Did you know at the time, or alternatively do you know now, what the farm where the shooting took place was called, or to whom it belonged? Q. How long was it before anyone found you there? A. After the woodpile, we left and went into a pigsty, because that was warmer and safer. I think we were there about three or four days before anybody found us. Q. Did you have anything to eat during that time? A. Just a few raw potatoes. Q. How was Pooley during this time? A. He was in pretty bad shape. Q. Who found you on the third or fourth day? Q. Did she do anything for you? A. She did everything for us. A. She brought us food and drink, and she brought dressings for Pooley’s leg. Q. And how long was it before you were moved from the place in which you were hiding, and taken off elsewhere? A. You mean from the pigsty? Q. You were ten days in or near the pigsty? Q. And what happened then, where were you taken? A. We were taken to Bethune hospital. Q. Who came and fetched you? Q. And when you got to Bethune hospital, were you then again under the control of the German authorities? Q. How long did you stay in the hospital? A. I stayed in until – about sixteen days I think I was in hospital – I think until 27th June, that was when I came out. A. I joined a column of prisoners from France. Q. Were you taken to Germany? Did you stay the rest to the war there as a prisoner? A. I was taken to Poland eventually. Q. You went to Poland? Q. Were you repatriated at the end of the war? Q. What happened to Pooley? Where did you leave him? A. I left him in Bethune hospital. Q. Did you see him again from then until the end of the war? A. No, I never saw Pooley again until last week. Q. That was when both of you came out here? Q. Did you have any communication with him during or since the war? A. I have spoken to him only on the telephone, that is all. Q. Did you, when you were in Germany as a prisoner, report this shooting to any German authorities? Q. Did you know that you and Pooley were the only two survivors of all those people? A. I gathered we were the only two survivors. Q. You thought that it was the most probable, there was no sign of life in anyone else there? Q. Did you report the facts when you came home to England? At this stage the prosecution calls for an adjournment before O’Callaghan is questioned by the prosecution counsel Mr. T. Field- Fisher and the defence counsel Dr Uhde about the identification of the perpetrator of the massacre, Fritz Knoechlein. Pooley’s Affidavit: This part of the affidavit begins following the surrender and march to Louis Creton’s farm. We were ordered to march again and it was at this moment that I saw what had apparently been prepared for us. At the far end of the field opposite the farm house I saw 2 machine guns, one of which was already in position and the other in the process of being set up. Some distance behind the guns there was a hedge. Standing just inside the gate leading into the field was a group of about a dozen Germans who seemed to be having a discussion. One of the group whom I saw at close quarters a few moments later I identified as an officer by the silver cord on his peaked cap. He was about 5’ 10’’ tall, was slim build, had a dark face with a prominent hooked nose and dark piercing eyes and was 35-40 years old. I am inclined to think that this group comprised of officers and NCOs, but I cannot give the exact number of each. I cannot describe any of the other officers or NCOs and I do not think I would be able to recognise any of them were I to see them again. At this moment the troops guarding us ordered us to continue the march. At this point we left the road and went into the field through the gate and I noticed at the foot of the wall of the farm house (which was then on our left) a large hole which was at least 5 feet deep, 15 to 20 feet long and about 8 feet broad. When the first prisoners reached the far end of the hole firing commenced. I was just entering the gate. It seemed that as the men were hit they fell into the hole. When I reached the hole the man nearest to me, Private WARD, was hit and I felt a sharp pain in my left knee and fell into the hole. I fell on top of some men who were already lying there and others fell on top of me. Firing continued for a few seconds during which I noticed Major RYDER sitting inside the hole with his back to the side nearest to the wall. He seemed to me to be very badly hit. Groans were coming from men lying in the hole and it was at this point that 3 Germans jumped down in the hole near Major RYDER evidently for the purpose of finishing off any prisoners still alive with bayonets. These Germans evidentially climbed out of the hole again because further shooting then started with revolvers and rifles from the edge of the hole. One of the men beneath me moved and two shots were fired into the heap of bodies, both of which hit me in the left leg. At the sound of a whistle firing ceased and all Germans appeared to move away because I heard no further sound in my immediate vicinity. The shooting took place at approximately 1530 hours. After lying like this for about 3 or 4 hours, sometimes conscious, sometime unconscious, I at last rallied myself and looked around carefully to see if all was clear. Seeing nobody I extricated myself so that I could see the whole of the rim of the hole. There was nobody in sight. At this time I heard what I took to be a snore coming from one of the men lying close to me. I reached over and shook him and asked if he was alright. He answered “Yes, how are you?”, or something like that. I told him that my leg was smashed up, but that we had better get out of this quickly. This man proved to be Private BILL O’CALLAGHAN of the Signals Section. We heard Germans celebrating in the courtyard of the farm house and decided to move away from the area as quickly as possible. This was very difficult because I could only move by dragging myself backward along the ground. We eventually reached another farm house which had been burned out and which was several hundred yards away for the scene of the shooting. We hid in the ruins of the farm, eating raw potatoes and drinking ditchwater and having several narrow escapes from being discovered by the Germans until we were found four days later by a French woman, whom I now know to be Mme CRETON, the wife of the owner of the farm. This woman, with the knowledge of some of the other villagers, made us as comfortable as she could and provided us with the first decent food we had had for days. Each morning before it was light she or her son would bring us food and drink at great personal risk, the Germans having ordered the death penalty for anyone harbouring British soldiers. Madame CRETON herself told us of this order. Eventually I was forced to choose between causing severe retaliation to be taken against the French civilians sheltering me and giving myself up. In view of my wounds I decided in favour of the latter. After I had made this decision and while we were still hiding in the ruins of the farm a German officer, accompanied by two armed other ranks, were sent there by the head man of the village. Private O’CALLAGHAN was away from the ruins at this time. The German medical officer informed me that he could do nothing for me as they were overwhelmed with work by their own wounded, but that he would issue orders to the effect that I was to be placed in the care of the villagers and that they would be held responsible for my custody. Private O’CALLAGHAN refused to leave me and try to escape himself. I was taken in an ambulance to a French civilian hospital in BETHUNE from where I was transported to PARIS and eventually to GERMANY. Private O’CALLAGHAN accompanied me to the hospital in BETHUNE, but left there, I believe for BELGIUM, about 48 hours after we arrived. 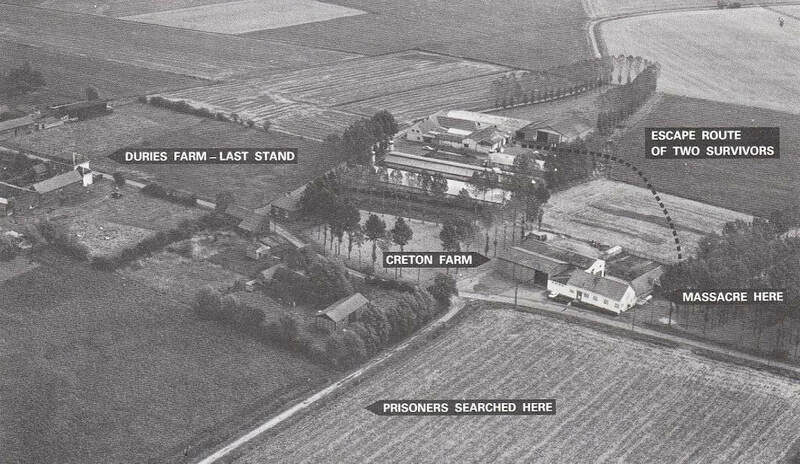 Pooley’s Cross Examination taken up from the surrender and march to Louis Creton’s farm. Pooley is cross examined by the prosecution counsel Mr. T. Field-Fisher. There is a small interlude in respect of the identification of the accused. Q. Now you said that you halted on the road a few yards from this gateway. How long did you wait on this roadway? A. Ten to fifteen minutes. Q. Now did you see anything that particularly took your attention on the field on the right or the road? A. The thing I noticed in particular was that the enemy were moving machine guns into position at the far end of the field. Q. How many machine guns? A. There were two. On had already been set up in position; the other was in the act of being transported across the field. Q. And in which direction were those guns, or the one which was already set up, facing? MR. INTERPRETER: The barrel, sir? WITNESS: They were roughly in line with the wall of the farmhouse. Q. And about how far do you suppose were they from the wall of the farmhouse? A. I should say 150 yards. Q. What was there behind the guns? Was there another field or a wall or a hedge or something like that? A. Immediately behind the guns was a hedge. Q. What sort of hedge – a high one, a thick one or what? at the far end of the field. Q. Now then, did you then start marching again into the gateway? A. Yes, we were ordered to turn and march through the gate into the field. Q. Again, can you say where the order to march came from? A. The order had been passed down the column from the German soldiery, but the order appeared to come from a group of German officers or N.C.O’s who were standing near the head of the column at the time. Q. Was this group standing near the gateway through which you marched? Q. Now where were you in the column – in the front, the middle or the rear? A. I was about a third of the way along the column from the front. Q. And then did you march in through the gate? Q. And when you marched in through the gate, did you pass this group of German officers or N.C.O’s you have referred to? A. As I marched through the gate they were standing on my right. Q. Were they quite close to you? A. Yes, quite close – within a few yards. Q. Did you notice any one of them in particular? A. I did notice one man in particular because he appeared to me to be an officer. Q. What made you think at the time that he was an officer? A. He was wearing an officer’s uniform cap. It had a silver braid around it. Q. And was he the only one who particularly attracted your attention? Q. Did you know what was going to happen to you? Were you told what was going to happen to you? A. No, I deduced from the fact that they were putting up the machine guns what was in store for us. Q. Was anything said to you at all by any German official hinting at what was going to happen? A. Nothing was said to us by anybody in authority that we were going to be shot, apart from one little incident when we were being searched. I was threatened with a revolver by a German soldier. Q. Apart from that, nothing? A. Apart from that there was nothing. Q. Now then, do you think that you might perhaps recognise that German officer you noticed particularly again if you saw him? Q. Will you see if you can see him in the court today? Q. Would you like to have a closer look at him and get him to stand up? THE JUDGE ADVOCATE: Mr. Field-Fisher, it just occurs to me – can one acquire an S.S. uniform? MR. FIELD-FISHER: I should be extremely desirous of getting one if possible. That is always what we are up against in these cases. MR. FIELD-FISHER: Do you think Pooley, it would assist you to make up your mind one way or the other if he dressed in uniform? A. It would be more satisfactory to me, sir, if he could be. Q. As far as you can say at this moment, you think that is the man? A. Yes, that man was present. Mr. FIELD-FISHER: (To the Judge Advocate). ShalI I endeavor to see if that is possible sir? THE JUDGE ADVOCATE: It seems to me, Mr. Field-Fisher, the case very largely turns on this important question. I can quite see the authorities don’t like this to be done, but if he were to change in this court, put his uniform on for a few minutes and then change back into civilian clothes, I can see no objection to that at all. Mr. FIELD-FISHER: I can see no objection from the defence point of view because, as you say, this is an important point. The only other thing, sir, is that I have photographs of this man in German uniform which I think he will admit are the accused. THE JUDE ADVOCATE: If it were arranged that for the first time that photograph is shown to a witness before he has given evidence and before he has seen the accused, that would be satisfactory. Mr. FIELD-FISHER: I will pursue that course with the second witness. THE JUDGE ADVOCATE: Leave him until such time as you have acquired those photographs. MR. FIELD-FISHER: At the moment the position is that this witness has said he thinks this is the man, and I will endeavour to get the man dressed. THE JUDGE ADVOCATE: I am unaware of the rules, but perhaps you can find out if that is possible (To Interpreter). You had better translate the gist of that for the benefit of the accused. MR. FIELD-FISHER: Well, of course, they will be shown to the defence. I have them here now, sir. THE JUDGE ADVOCATE: Alternatively, Dr.Uhde, the other suggestion I made is that the accused appears here in uniform for a few moments, when this witness and the other English witness could see him. (to Mr. Field-Fisher). If you like you can dress two or three men up and let them sit next to the accused. MR. FIELD-FISHER: Yes, sir. I have no objection to that. THE JUDGE ADVOCATE: I think that would be the best way. Get two or three in addition to the accused. MR FIELD-FISHER: The only thing is the difficulty of providing uniforms. It might be possible to provide one, but whether it will be possible to get two or three, I don’t know. THE JUDGE ADVOCATE: Any way, if that can be done, I think that is what we should do. MR. FIELD-FISHER (To witness). After you had marched through the gate what was the next thing that happened? Q. Now this hole that you mentioned, did that look as if it were part of the farmhouse normally, or do you think it had been specially dug? A. Looking back on it now, I should say that it had been there for a good while because there was no earth in the vicinity and if it had been dug quite recently for the purpose, I should have thought there would have been earth lying about, but I saw none. Q. When the firing started, were you yourself already inside the field – paddock – or whatever it was called? A. When the firing started I was just entering the gate. Q. And did you continue marching and the others with you also continue marching into the field? A. Yes. Because we realised there was nothing we could do about it. Q. So, in fact, you virtually walked into a hail of bullets? A. I appeared to be hit in the knee, I know that it was a ricochet, and I fell into the hole. Q. Now did everybody else fall down into the hole or near it? Q. Apart from yourself, was everybody killed immediately, or did some live some time? A. We were not all killed outright by the M.G. fire. A. When the machine gun ceased firing, the German soldiers present congregated round the edge of the pit and anybody who was still groaning or moving was shot at. I heard several men groaning and I know they ceased groaning, because they were shot again. Q. Was anything used to finish people off except shots from pistols or rifles? A. At this time I only had my ears to rely on. There were about three men lying on top of me. My view was absolutely cut off, but small arms appeared to be in use. Q. What do you mean by small arms? Q. Did any of the Germans get down into the hole or did they all stay round the edge? A. After everybody had been silenced – that would have been after I had received two more shots in the leg – everybody appeared to be silent – two German soldiers jumped down into the hole at the far end – that would be where Major Ryder was lying. I heard them fix their bayonets and I thought they were going to finish off anybody who was still alive with the bayonet. Q. Did you, in fact, see them do that, or not? A. No, I saw them pull one man away from the pile and then they must have received an order to get out of the hole again, because they climbed back out again. Q. Did you hear an order or anything like an order to cease fire? What caused the guns to stop firing? A. I was in the hole when the guns ceased firing. The order might have been given by the N.C.O. in charge of the machine gun section or they might have stopped because there were no more men to shoot down. Q. You have not quite understood my question. Did you hear any sound which caused the guns to stop immediately? Q. Yes. Did you hear anything, and then immediately afterwards the guns stopped. If you cannot remember don’t worry; it doesn’t matter. A. There was a lot of shouting at the time. I suppose it was an order – it might have been an order. Q. Now, can you put an approximate time of this execution? A. I should say it was approximately 3.30 in the afternoon – it may have been later. Q. And can you put an approximate time to when the surrender took place? MR FIELD-FISHER: Is there anything that helps you fix the time of the surrender – anything which happened before that of which you know the time. A. Yes. We received our last wireless message from the Brigadier Commander at 12.30. Q. And from that you are able to approximately to fix the time of the surrender and then the subsequent shooting? Q. Now after the shooting finished, what happened to you? A. I lay in the hole very quietly until it began to get dark and while I was lying there I tried to work out some plan of how to get away. Q. Now, how many times had you been shot? A. Before I was taken prisoner I was hit in the arm. I had a portion of mortar bomb in my right side. I had a small wound in my left knee. When the machine guns were firing I received another on in the knee off the wall. A. And whilst I was in the hole I received two more in the same leg. Q. And those last two you received from what? A. I am inclined to think that they came from some automatic weapon. Q. After you had lain there some time trying to form a plan, what was the next thing you became conscious of? A. When it began to get dusk – it started to rain as well – I slowly raised myself so that I could see all round the edge of the pit. I made sure that nobody was standing in the vicinity as far as I could see. I moved the men away from me so that I could raise myself up, and then I heard a noise – it was a snore really. I reached over and spoke to this man. He proved to be Private O’Callaghan. Q. Did you wake him up? A. Yes. He woke up and I spoke to him and touched him. Q. What did you two do? A. We decided to get away from there as soon as we could and as fast as we could. We realised that if we were caught we would be finished. A. I hauled myself up and stood on the edge of the pit, but then my leg gave way and I found I could not stand at all. I was helped out of the hole by O’Callaghan and the only way I could move was on my bottom and hauling myself along the ground backwards. Q. Where did you two drag yourselves to? A. We made our way to a farm which had been burnt out which I now know to be owned by Madame Creton. Q. How far was that from the courtyard where the shooting took place? A. I estimated it at the time at about 1,700 yards, but it might have been less than that because it did seem a long way to me at the time. A. The Germans were sitting in the courtyard of the farmhouse where we were shot. They appeared to be having a meal and celebrating. MR. INTERPRETER: I don’t quite understand “courtyard”? WITNESS: The court-yard of a farm is usually enclosed. The farm has usually got a court-yard in it which is usually surrounded by walls. They were sitting in there. They had a big fire and they appeared to be eating and drinking. Mr. FIELD- FISHER: Did they sound as if they were having a good time? Q. And this was very near to where the pile of bodies was. A. Yes it was just through the door. Q. After you had dragged yourselves to this other farmhouse, how long did you remain there? A. We remained on Mme. Creton’s farm for about 9 or 10 days. Q. How long was it before anybody else found you? A. I think it was three, it might have been four days. Q. And who then came and found you? A. The owner of the farm Mme. Creton. Q. And did she look after you at all? A. Yes. She was very good to us. A. Well she – at the risk of her own life because the enemy had issued an order that any civilians found harbouring British wounded would be summarily shot, and she knew this – arranged to send us up something to eat and drink. Q. And how were you eventually moved from there. A. I went by French civilian ambulance into the Civilian Hospital at Bethune. Q. And you were subsequently handed over to the German authorities? A. All the wounded in the civilian hospital were under the supervision of Germans. It was known that we were there. Q. So you became a prisoner again from the moment you went into the hospital? Q. And you were correctly treated there? A. Yes, we were very well treated there. Q. Before you were taken to the hospital and while you were sheltering in this farm, did you see any Germans at any time come up to see you? A. A German medical officer came up into the pig-sty where I was sheltering with two German soldiers. They were Red Cross men but they were armed. A. They were very correct. They were very kind. The officer spoke English. He asked me if I was wounded. I said ‘yes’. He then asked me where O’Callaghan was. He was under the impression that O’Callaghan must have gone down to the village for food. I told him that was not so, he would be back in a few moments. The German officer then informed me that he was sorry to see me like that, but there was nothing he could do for me at that moment, as they were absolutely overwhelmed with their own wounded. Q. Did you tell him or any German you subsequently came into contact with, the story of the shooting? Q. Now why was that? A. I realised only too well that if the Germans knew that there were any survivors they would make sure that they did not live long enough to speak about it. Q. Did you realise that you and O’Callaghan were the only two survivors from all the number who had been mown down by the machine guns? A. Yes. I thought we were the only survivors. Q. At any rate you saw no sign of life in any of the others? Q. And were you taken to Germany as a prisoner after you left Bethune Hospital? A. No, first of all I was sent to Paris. A. I went to Steprode in Germany. Q. And were you eventually repatriated from Germany to England? A. Yes in October 1943. Q. And when you got home, did you report the facts of this shooting? A. Yes I was interrogated at Kingston Convalescent Camp by two officers. They asked me who the other survivor was. They asked me his name but I refused to divulge this because he was still over in Germany, and I considered it very unsafe. Q. And have you been back to visit the scene since? A. Yes. I went over there to satisfy myself on one or two points. Q. And did you see the barn where the shooting was carried out? Q. Did you see the wall in front of which you were all shot? A. Yes. I examined the wall. Q. And did you see anything on it of interest? A. It was pitted and marked by machine gun fire which was what I expected to see. Q. About what height were the machine gun marks on the wall? A. Approximately the height of the average man’s head. Q. Mr. Pooley what is your age? Q. What did you do after you were brought back to England from Germany in 1943? A. I went into a convalescent camp before my discharge from the services, and then resumed my employment. Q. Did you join the Services again? Q. Who had requested you in 1946 to return to that area in France? A. Nobody requested me, I went over there on my own accord, to see some friends. Q. Did you only go there to visit some friends? A. I had a twofold purpose, I wished to see my friends and I also wished to visit the scene of the crime. Q. Had anyone interrogated you shortly before you went to France, interrogated you about this crime? A, No, not up to that time, I think. Q. What did you mean when you said, in answer to the learned Prosecutor’s question, that the purpose of your journey was to clear up one or two points? A. I wished to satisfy myself. You see, this happened to me and I wanted to see for myself just where it happened, and make sure in my own mind that it was actually fact and not a dream. Q. I am sure you must have known, before visiting the place, that it was not a dream, but a fact? A. I knew, but other people refused to believe it. Q. Who does not believe you? A. The people I did mention it to, they pooh-poohed the story and they would not listen. Q. Did the officers who questioned you after your return in 1943 reject this story as well? A. Yes, they rejected it because there was no corroborative evidence at that time. Q. Did no one – I mean, in an official capacity – request you in 1946 to go to France? Q. Did you pay the expense of this journey out of your own pocket? Q. Did you find the place of the shooting without any difficulty at all? A. I found it, with the assistance of a French friend. Q. Did this friend live in the area? Q. Did he live in Paradis? A. No, not in Paradis. Q. Where did he live? A. I forgot the name of the place. Q. Did you visit him in the place where he lived? Q. Now, surely you must remember today where you went in 1946? Q. What was the name of the place? A. I cannot remember the name, but if you have a map I can soon find it. Q. You have got the map in front of you – I thought it was near Paradis? (The witness examines the map). A. Yes, it is Richebourg. MR INTERPRETER: It is in the square 46/31. DR. UHDE: Could this large map behind me be placed in such a position as to enable the witness to explain certain points with the aid of the map? THE JUDGE ADVOCATE: Have you seen this map Mr. Field-Fisher? MR FIELD-FISHER: I have seen it. I believe it is an enlarged scale of a portion of the map, Exhibit 1? DR. UHDE: Could you show on this map the exact place where you were taken prisoner? This is an enlargement of the map you are holding in your hands at the moment. THE JUDGE ADVOCATE: What is the map reference? MR. FIELD-FISHER: It is 41/34.3. DR. UHDE: Where is the point where you and your comrades were disarmed? MR.FIELD-FISHER: They were not disarmed. They did not say they were disarmed. DR. UHDE: What I mean is, where you were deprived of your equipment. (The witness indicates to the position on the map). Are you quite certain that you went over a cross-roads? A Yes we crossed the road into the field on the far side of the road. Q. Could it not have been a field here (indicating)? A. No, it was to the north of the road, to the north of the Rue Du Paradis. Q. Where did you go to after the equipment had been taken off you? A. We were formed up on the road, this road (indicating). THE JUDGE ADVOCATE: Was that the Rue du Paradis? A. We were marched down into the field. Q. Which field? (Witness indicates). You mean the actual field where the shooting eventually took place? THE JUDGE ADVOCATE: What is your question, what that represents. DR.UHDE: NO, I just wanted to know if this was the field where the shooting eventually took place. (To the witness): I understood you to say that nearby there was a sort of chapel? MR. INTERPRETER: I think that was my interpretation, I did not find the correct word in German. THE JUDGE ADVOCATE: What was the word? MR. INTERPRETER: A sort of shrine. THE JUDGE ADVOCATE: (to the witness): With an image of Jesus Christ, is that what you mean? DR UHDE: Where is that? (the witness indicates on the map). MR FIELD-FISHER: It is represented on the plan, Sir, by a small symbol. It is a calvary. DR. UHDE: Was this, which is indicated here, a building or what sort of thing was it? A. It was a thing which I did not notice very much, because you see so many of them in France and you see them without noticing them, if you know what I mean. DR. UHDE: You are quite certain that it was there, where you pointed it out on the map? THE JUDGE ADVOCATE: If it is on the map. It must be there. DR.UHDE: Can you show on this map where you crept to, after the shooting, together with O’Callaghan? THE JUDGE ADVOCATE: Had he better not tell us? It is rather difficult to point out on a map, had you better not ask him if it was in the same direction he had come before the shooting, or whether it was a different direction? DR, UHDE: Using as a basis for your answer, the direction from which you had come, in which direction did you creep away from the place after the shooting – remembering the direction from which you had come originally? Q. Right angles, seen from which point? A. Our line of march. MR. INTERPRETER: March to the place of shooting? DR. UHDE: You were travelling down this way (indicating on the map). The right angle may be to the left or to the right. A. Well I will say in a south westerly direction. Q. And eventually you landed in a house belonging to Madame Creton? Q. Did you revisit that house, later on? Q. Could you show this house to the court, on this map? A. I cannot be certain that I can. Q. But you said that the distance between this house you went to, and the place of the shooting, was about 1,700 yards, or less? A. I should say it was as far as that. Q. Down this way (indicating on the map)? A. It would be in a more south-easterly direction. Q. You then arrived at the house which belongs to Madame Creton? THE JUDGE ADVOCATE: He has told us that three times now, Dr. Uhde. DR.UHDE: You told us that at this point it was about 1300 hours, and the shooting was carried out two and a half hours later, about 1530 hours. What did you do between that time? A. We were in that field where we were searched. We remained there for a considerable time. We formed up on the road and we were made to stand on the road with our hands on our heads. Q. What did you do after you returned from France in 1946? A. I resumed my work. Q. Did you not tell anyone, after 1946, about your experiences in 1940? Q. To whom did you talk? A. The War Crimes investigation people. A. I believe that the information came from France, and was circulated through the French military to the British, and I was informed through the medium of the Metropolitan Police. Q. What did you state then? Q. Did you also take the oath? A. The statement was sworn, yes. Q. And in your opinion, the statement that you made is correct? Q. Have you ever, before today, seen the accused? A. He was one of a group who was standing near the gate when we walked into the field. Q. That is what you told the court this morning, but I mean to say is, did you ever see him again later? A. No. I beg your pardon – you mean, have I seen him since the end of the war? A. Towards the latter part of 1946, I think it was. Q. How did it come about that you saw him? A. It was at the headquarters of the War Crimes Investigation. At this stage of the cross-examination of Bert Pooley the defence counsellor, Dr. Uhde, questions Pooley about the identification of the perpetrator of the massacre, Fritz Knoechlein. Neighbouring German divisions soon became aware of the massacre and the news spread until eventually Leutnantgeneral Erich Höpner, commander of the German forces in France, got to hear of it. He disliked the SS, especially Eicke, and was determined to have him dismissed if charges of mistreatment or murdering of prisoners could be brought. However, no meaningful investigation was undertaken as steps to do so were blocked by the SS, who did not consider the Wehrmacht sufficiently without bias to carry out an investigation. Nevertheless, many SS officers themselves were appalled by the massacre; some even challenged Knöechlein to a duel. None were ever fought and the stain against the Totenkopf remained. Its reputation grew and darkened after the invasion of Soviet Russia in 1941. Leutnantgeneral Erich Höpner, was an officer of the old school and had problems coming to terms with the concept of a parallel army to the Wehrmacht and the Waffen SS massacre of the Norfolks confirmed his concerns. The day after the massacre the Germans enlisted locals to bury the bodies in a shallow mass grave, but not before a number of German officers and a German journalist had visited the scene. Gunter d’Alquen was a member of the SS War Correspondents, who arrived at the farm with Dr Thum, the Totenkopf deputy legal adviser. Gunter d’Alquen made a report of what he saw. In October 1964, Madame Creton and her son Victor travelled to Norwich to be reunited with Bill O'Callaghan. They met up in the Royal Hotel (now no longer an hotel) and were entertained to lunch by the Royal Norfolk Old Comrades' Association and the local branch of the Dunkirk Veterans' Association. Madame Creton and Bill had originally been re-united in 1954 at Le Paradis. Private Bob Brown was fighting in the area but not involved directly in the massacre. Bob has his own page which contains his memories of the fateful day. This section can be accessed by clicking here. Below is a map which illustrates Bob's movements on 27th May. The map comes from Bob's personal collection of artifacts.